Showing 22 articles from October 5, 2016. Colton Harris Moore, who gained international notoriety as the "Barefoot Bandit" was released from Stafford Creek Corrections Center in Aberdeen, Wash., on Sept. 28. Hoquiam residents Rochelle Pritchett and Vicki Guerrero hadn't been in their storefront space at 722 Simpson Avenue for long when they spoke with the Herald on a recent Friday afternoon, having just made the leap to opening their own shared specialty shop within the past several weeks. Legislative candidates seeking to represent the state's 19th District answered questions from a panel made up of print and radio media members at a forum held at Aberdeen High School on Sept. 22. Questions ran the gamut of possible topics. Candidates for Washington's 24th Legislative District appeared at Hoquiam High School on Sept. 27, where they answered questions from a panel of media representatives. The state's 24th Legislative District includes an area encompassing all of Clallam and Jefferson counties and most of Grays Harbor County. Members of the Dukes of Swing perform at a dance at Elks Lodge #593 in Aberdeen on Sept. 29. The group will perform a benefit for veterans on Oct. 8 at Fort Columbia Theater in Chinook. The environmental review for the proposed Westway Terminal crude oil expansion project in Grays Harbor is complete, the City of Hoquiam and the Washington Department of Ecology reported in a joint press release on Sept. 30. The review identifies impacts stemming from the project proposal, as well as possible mitigation measures. United Way of Grays Harbor, which serves Grays Harbor and Pacific counties, is currently holding a coat, shoe, and blanket drive through Oct. 28. 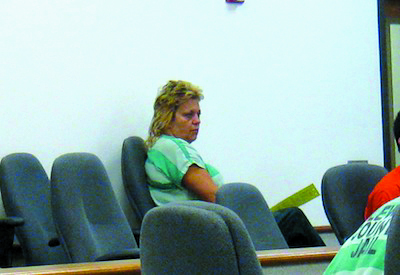 Cheryl Oleachea in the court room, charged with second-degree theft. The clerk from Winlock's Handi store has been arrested in connection with the robbery there earlier this month. The Lewis County Historical Museum has planned several events in October to help people get in the Halloween spirit. 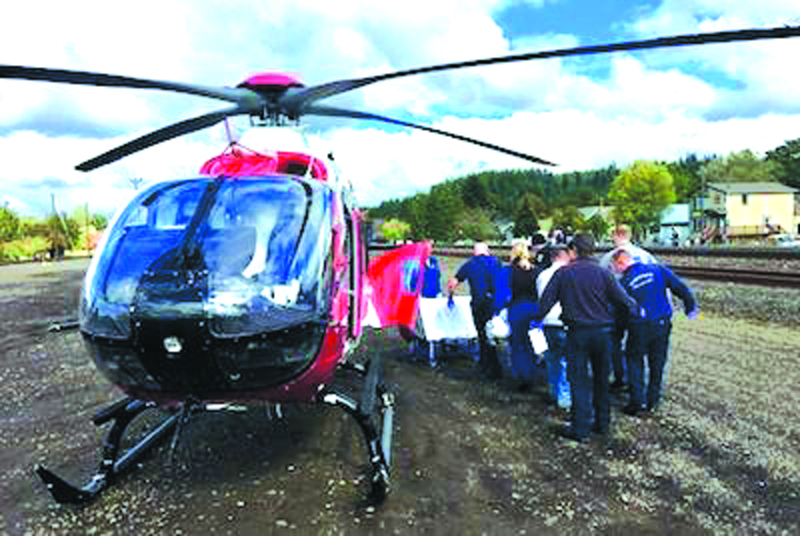 Photo courtesy of Riverside Fire Authority - First responders bring the pedestrian struck by the train to the helicopter and prep her to be airlifted. Centralia police are working with BNSF to figure out what sort of train struck a 21-year-old woman on Sunday, Oct. 2, and how it happened. Toledo once again dominated the line of scrimmage on both sides of the ball, and this week the result was a 35-0 victory over the Toutle Lake Ducks in the opening week of divisional football action. At the last Winlock City Council Meeting, the Winlock Improvement Network presented the Winlock Parks Board with a donation. The donation in total amounted to $518.89. The Zonta Club of Centralia/Chehalis will host its annual used book sale at the Lewis County Mall in Centralia on Oct. 6 through Oct. 8. This is the club's thirtieth year of offering people the chance to buy books and help the area Zonta Club raise money for local scholarship funds. Staff representing local libraries within Pacific County were in attendance for a Sept. 27 presentation to the county commissioners by Timberland Regional Library Director Cheryl Heywood. At the Raymond City Council meeting on Monday, Oct. 3, a member of the public expressed concern over planned re-treeing work. Pacific County commissioners voted to adopt a resolution accepting an updated Shoreline Master Plan for the county following a public hearing on Sept. 27. Raymond area photographer Cathy Russ plans to self-publish her hardbound book "Barns: Pacific County Backroads and Highways" at the end of this month through Chehalis-based Gorham Printing. Olivia Frasier, 6, gets creative at the Lewis-Pacific Swiss Society's annual Oktoberfest in Frances on Saturday, Oct. 1. For additional photos from the event see page 8. Willapa Valley Middle and High School is celebrating a School of Distinction award they recently received for sustained improvement in English language arts and math over a five-year period. 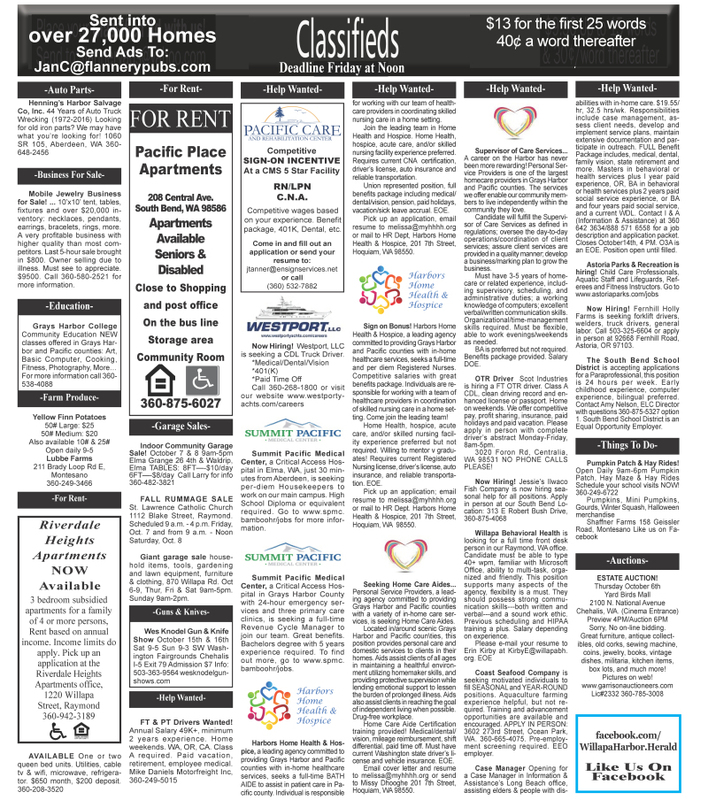 The Willapa Harbor Herald asked the two candidates running for Pacific County Commissioner No. 2 one question: Incorporating your agenda, why should voters vote for you instead of your opponent? Here are their responses.